One of my favourite times of the year has got to be Easter. There are so many reasons to celebrate at this time of year. This year I would have to say a main cause for celebration is the fact that we all survived a long, hard, cold winter! Yay US! And now it’s Spring! Everywhere you look green buds are popping out of the ground, robins can be spotted bobbing across the yard, and colour is returning to our landscapes. What’s not to love? Often times Easter is the first families will gather together to enjoy a special dinner since Christmas. You’ve all put in 3 long months enduring winter, so who wants to spend special time with family slaving in the kitchen? No one! You can easily make your plans ahead of time with a personal chef; everything from choosing the date and time, confirming the guest list, and finalizing your Easter menu. Did you know a personal chef will customize the menu to exactly what you want? Even if there are specific dietary restrictions for some of your guests, a manjya chef can accommodate. Also, you can choose to have a personal chef prepare the meal ahead of time and drop off for you to serve, or you can have a personal chef come to your home cook the meal, serve and clean-up. Now, think how relieved you will be once all the Easter dinner plans are made, and yet you won’t have to do any of the work. 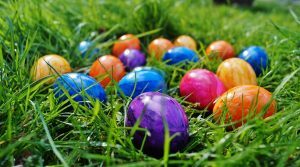 You could use that time leading up to your Easter party to focus on other fun things that might take place at your gathering. Determine wine pairings that will complement the dinner your personal chef will be preparing. Like at my house, your guests might be just the ‘red’ or ‘white’ kind of people, but think how impressed they will be knowing you put this extra thought into making your Easter dinner special. If you like the thought of this extra detail, but don’t want to do the work yourself, many of our personal chefs can provide this service to you. How about coming up with special and unique ways to decorate your home and Easter dinner table? Will there be a bunch of little people coming over for your Easter gathering? Get some Easter crafts ready for them. You will love how this will keep them occupied. No Easter celebration, whether with kids or not, is complete without a little (or big) Easter egg hunt! You will have time to organize and participate in this because a personal chef is taking care of everything to do with your meal. Get your gang out there, no matter their age, and feel like a kids again! Manjya chefs are currently filling their calendars for Easter dinners. To get your dinner registered with us and to receive bids from manjya chefs contact us today. Have you Considered a Personal Chef Meal for your Passover Seder?Easter Brunch with Style!